"The unspoken secret is that many people find the Bible boring. This is a serious problem and a quite recent one. Ancient Greek* had no word for boredom. The word did not have its current meaning in English until the last few centuries. We look at the ancient world, and they had no television, no Internet, no movies, no iTunes, and virtually no books--and we think of how boring it must have been. Our capacity not only to read God's Word, but to lead useful, fulfilling lives in general, increasingly depends on our capacity to break away from the crowd to read, to think, to use the minds God gave us, instead of the hapless victim impulse and the unreflective herd mentality. There is an important difference between the politician who is simply an able tactician, and the politician who is a creative political leader. The former accepts political conditions as given and fashions a campaign and a set of policies best suited to the existing conditions. The latter tries to change the matrix of political forces amid which he operates, in order that he may better lead the people in the direction he wants to go. The former operates within slender margins; the latter, through sheer will and conviction as well as political skill, tries to widen the margins within which he operates. He seeks not merely to win votes but consciously to alter basic political forces such as pubic opinion, party power, interest-group pressure, the governmental system. See here. Read this first. I'm a big fan of the original Sherlock Holmes stories by Arthur Conan Doyle and just finished re-reading the first Holmes novella, A Study in Scarlet, published in 1887. In it, Holmes, with his super-human powers of deduction, determines "whodunit," yet two bumbling Scotland Yard inspectors, Gregson and Lestrade get the credit. This outrages Holmes' friend, Dr. Watson, even though Holmes had warned him several times that this would be the case. "I don't see that they had much to do with the [murderer's] capture," he tells Holmes. Holmes' reply: "What you do in this world is a matter of no consequence...The question is, what can you make people believe that you have done?" This was 1887, folks! Yet Holmes' creator, Doyle, understood the game of celebrity, advertising, and PR that's played today in politics, business, and entertainment: Perception is reality. In the case of politics and governance, it seems, that pols and handlers agree that it isn't what's actually accomplished, it's what voters can be convinced has been accomplished. It isn't right. But armies of handlers and media consultants prove that the "perception is reality" game is still afoot. Most react as Holmes did. "It's how the game is played," says the cynical public. But Watson was right to be outraged, don't you think? that made Abraham Lincoln president. On the first Christian Pentecost, fifty days after Jesus' resurrection, the Holy Spirit came to a group of 120 of Jesus' first followers, who, as instructed, had gone to Jerusalem to await the Spirit's arrival. But Who exactly is the Holy Spirit? Jesus and the Scriptures reveal the Spirit to be the Third Person of the Trinity. Christians believe that there is just one God of the universe, but that this big God has three distinct, co-equal, and interdependent personalities: God the Father; God the Son (Jesus the Christ); and God the Holy Spirit. Be advised though, that the term, Trinity, never appears in Scripture, and that the concept was only understood after the first Christians had experienced all three persons of the "Godhead." That's because, as Billy Graham writes in his classic book, The Holy Spirit, "God unfolds his revelation of Himself in the Bible progressively." Like a would-be groom wooing a bride, God took centuries to reveal Himself and His true nature to humanity, beginning with the mother and father of ancient Israel, Sarah and Abraham; then to their descendants to whom He gave the Torah and the promise of a Messiah; then, definitively in that Messiah, Jesus; and at Pentecost and beyond, in the Holy Spirit Who convicts us for sin, convinces us that the grace offered in Jesus can erase the power of sin and its consequence, death, over our lives, creates faith within the willing, and empowers us to live faithfully each day. And yet, through the eyes of faith, on this side of Jesus' cross and resurrection and the coming of the Holy Spirit at Pentecost, we can look back and see that the Spirit was always present, always active, even if He is, as the title of a book of essays referred to Him as the "shy member of the Trinity." In the days before weather satellites and Doppler radar, the wind--be it the wind of a hurricane, a desert sirocco, or a gentle breeze--showed up and left without notice. The wind is still, to this day, beyond our control. That's a good picture of the Holy Spirit. In fact, in the Greek of the New Testament, the word for "spirit"--pneuma--can be translated not only as spirit, but also as wind or breath. The same is true of its Hebrew equivalent in the Old Testament, ruach. The "Spirit of God" makes His first appearance in the Old Testament at its beginning, in Genesis 1:1-2, where we're told, "In the beginning when God created the heavens and the earth, 2the earth was a formless void and darkness covered the face of the deep, while a wind [ruach] from God swept over the face of the waters." He shows up again in Genesis 2:7, where the very breath [ruach] of God brings life to the first human being. The actual term "Holy Spirit" appears only three times in the Old Testament, but each is telling. In his prayer of confession, Psalm 51, David asks God not to take God's Holy Spirit from him. David recognizes that without God's Spirit, life is impossible, though a lifeless, joyless existence might go on. In Isaiah 63, in two places, the prophet recalls how God's people first grieved the Holy Spirit and voices the conviction that the Holy Spirit is the life-giver. During His time on earth, Jesus repeatedly promised the Holy Spirit to His followers, His Church. What the Holy Spirit has done and is doing in the days since the first Christian Pentecost will, hopefully, be the topic of this next Tidbit. 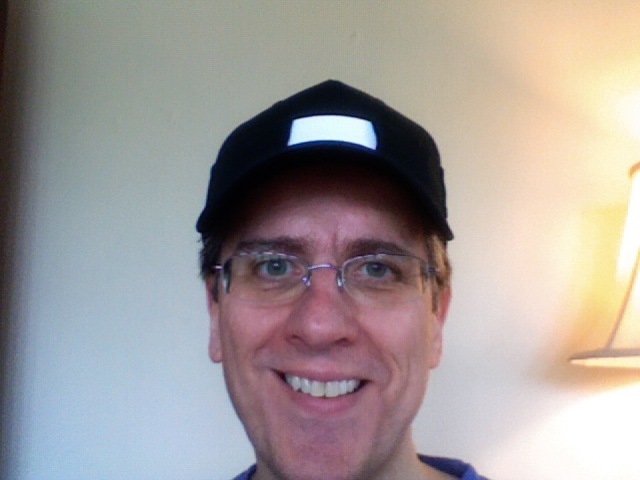 Here I am modeling my newest fashion acquisition, the clergy cap, complete with clerical tab. I got it from OldLutheran.com. Doing Our One and Only Job! Back in the 1950s, the operator of a lighthouse on the Atlantic coast was a popular man. That’s because he was so kind and considerate, a nice guy. Recreational boaters knew that if they ever ran out of gas while out cruising or fishing, they could contact the man at the lighthouse and he would show up with a few gallons of gas to get them going again. One week, a large number of boaters had asked for the lighthouse operator’s help. He hadn’t noticed that with all the gas he gave away, he was running low. This was the same fuel he needed to operate the generator that powered the lighthouse. You can imagine what happened. At the end of that week, there was a ferocious storm. Just when an incoming ship needed its way lighted into the harbor, there was no gas to power the lighthouse. Without its light, hundreds of people died at sea. The lighthouse operator was charged with criminal negligence. One person after another testified on his behalf. They told of how helpful the man was, how he was always willing to give a hand to those in distress. Ultimately though, the jury convicted him. Sharing Jesus with others: Letting people know that they can turn from sin and through Jesus, be with God forever. That is the mission of the Church. It’s the mission of every believer in Jesus Christ—whether we’re plumbers, teachers, engineers, homemakers, or even preachers. With words, deeds, and lives, we’re to let people know about the free gift of new and never-ending life offered to all by our God-in-the-flesh Savior, Jesus Christ. We’re to tell others about the Gospel, a word that means good news, the good news of new, everlasting life for all who believe in Jesus. On that special Pentecost Day in Jerusalem, the Holy Spirit came to make it possible for the first Jesus-followers to do their job. The Spirit still comes to believers who are open to Him. And yet, when we look at the sorry mess the world is in today, the Church seems powerless and irrelevant. We get involved in millions of different things from social gatherings to road clean-up projects, from fund-raising games of chance to political advocacy. All of these activities may be laudable. They may cause the world to think that we're nice people. But you and I know that what the world needs more than anything is Jesus Christ. If we who are part of Christ’s Church don’t share Christ with the world, who will? The actions of Jesus' followers on that Pentecost following Jesus’ ascension can help us learn how to share Christ with a world in desperate need of Him. First, their example teaches us that we must be humble. Those first disciples were only able to receive God’s power to fulfill their purpose in life because they were humble enough to seek God’s power. The Gospel of Luke says that after Jesus’ ascension ten days before the events recounted in today’s lesson from Acts, they “were continually…blessing God.” Their focus wasn’t on themselves or in the establishment or maintenance of a churchy institution. (They didn't even have a building, choir robes, hymnals, or offering plates!) Instead, their focus was on pointing their lives toward the God they’d met in the crucified and risen Jesus! Both of those men might have gotten themselves in less trouble had they humbly asked for help before they got into trouble! If you’re a normal human being, you’re bound to get frightened by the prospect of sharing your faith in Christ with someone else. Inviting them to worship. Telling them what Christ has done for you. We wonder if people will like us or dismiss us or see us as Bible-thumpers. To pursue the one purpose God has for all Christians, we need to be humble enough to go to God and admit our need of His help. When we do that, we receive God’s power. So, we need humility to fulfill our purpose in life. We also need to be honest. We need to admit our helplessness not just to God, but to each other. The world’s problems are huge. Our personal problems can be huge. We can’t face them, solve them, or deal with them without God. I was once talking with a woman active in her church where I was the guest preacher for a Saturday service. A lifelong Lutheran who loved her church and seemed to volunteer for everything, she was unencumbered by that fusty churchiness that can turn people off of God. She was real. She told me convincingly that there is great power that comes when people are able to admit their helplessness to one another. “You know where I learned that?” she asked me. When I said, “No,” she told me, “The sad thing is that I didn’t learn it in church. I learned it at Alcoholics Anonymous.” AA, rooted as it is in Christ, the Bible, and the Church, understands the power that comes to people when they admit their powerlessness. Too often in the institutionalized Church, we’re so busy trying to fool people into thinking that everything is okay in our lives, that we forget this truth. But God’s Word tells us that His power is perfected not in our strength, not in our niceness, not in our seeming to have it all together, but in our weakness. God can only use and work in the lives of people honest enough to admit their weakness. A woman approached me after worship once in one of our former parishes. This isn't exactly what she told me, but it's a fair paraphrase. “I want to thank you,” she said. “For what?” I asked. "Before we started worshiping here," she explained, "my husband was getting more and more difficult to live with. [I know that there's nobody here who can identify with that when it comes to their spouses!] He thought he knew all the answers. He didn’t listen. He was impatient with our kids. But here, through worship and the Bible studies and our time with others in the congregation, he’s come to understand that it’s OK not to have all the answers. It’s made him honest about his strengths and his limitations. He’s actually a joy to live with and the interesting thing is that these days, a lot of men he works with are getting interested in Jesus because he no longer pretends to have it all together.” That really happened, folks! King David once prayed, “You desire truth in the inward being.” It’s only when we’re real with God, honest with God, that the lies that fill us up can be drained off like the poisons they are, that God’s Spirit of truth can fill us, and we can begin to become the powerful, humble, Spirit-filled people God made us to be. Just before the events we’re told about in today’s second lesson happened, the book of Acts says that Jesus’ followers huddled together, “constantly devoting themselves to prayer.” They were humble before God and honest with one another and God sent the Holy Spirit so that they could fulfill their mission. Jesus’ first followers show us that we need to be humble and honest in order to fulfill our one and only mission in life, the mission of telling others about Jesus. But they show us one other thing that's necessary. They did it. They didn’t just talk about sharing Jesus. They didn't debate it or set up a study commission or consider other good things they might do. They responded to the call and the power of the Holy Spirit and they shared Jesus! They trusted God’s promise and went out into the city and shared the Good News of Jesus with the world around them. And thank God they did! Because they did, you and I live each day in the hope of Christ and the peace of God. They passed the message of Christ onto others, who passed it onto others in an unending chain of faithfulness and courage stretching over 2000 years! What might have happened had they just sat there after the Holy Spirit had come to them? Or if they had just gone to lunch, thinking, "That was inspiring"? Someone has said that the Church is always just one generation from extinction. It only survives as we Christians dare to share the good news with others. Even with the power of God's Holy Spirit given to us as baptized Christians, God's approach of sharing the Good News of Jesus through ordinary people like us, is a huge risk on God's part. But God must think that both the message and the means for sharing it are worth that risk! An old story says that after Jesus had risen from dead and gone back to heaven, an angel approached God the Father. "How do you plan on spreading the Gospel now, Lord?" "I'm going to send regular people out to share it?" The angel thought for a moment, no doubt considering how unreliable and fickle we human beings can be, and then asked, "What's Plan B? "And God said, "There is no Plan B." It’s up to us. (And it’s up to you, Stephen, Jared, Kylen, Jacob, and Critter!) May we never forget our mission of sharing Christ with others. And may we take the three simple steps taken by those first followers of Jesus. May we humbly ask for God’s help; honestly own our weakness to one another; and then, powered by God’s Spirit, share the best news the world will ever hear, the Good News of new and everlasting life for all who turn away from their sin and entrust their whole lives to the One Who called Himself the only way to eternity with God: Jesus Christ!